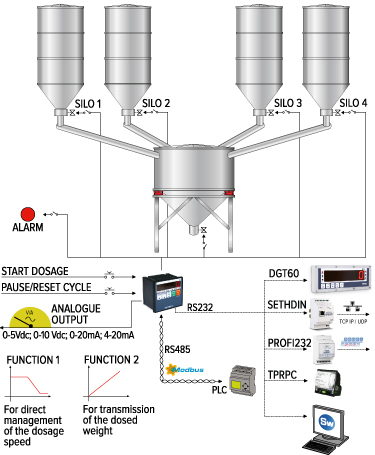 At the end of the last configured phase, the instrument enables the fine cycle contact and waits for the start of the new dosage, or automatically restarts with the following cycle. Configuration which allows the dosage of various products, in loading or unloading, as well as mixing and formulation, with the possibility of managing mixers, burners or vibrators using dedicated contacts. - Manual weight, for adding pre-weighed quantities to the dosage. - minimum tare and maximum tare values. 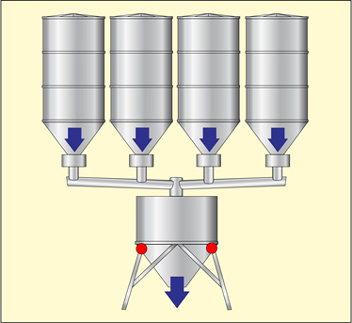 Automatic recalculation of the formula targets, by entering the total weight to be dosed. Quick introduction and selection of the dosage data, in the numeric keyboard models. One may assign to each product/phase a direct contact, for "fine" dosage, or a binary combination of contacts to codify up to 15 products/phases (only for models with 6 outputs). Checking the presence of the tare at the dosage start.